Life is One Big Top Ten (2008) rule is you get to choose their own topic. End of the year means it’s a great time for me to reflect on what were my top posts from my The Edublogger and Mobile Technology in TAFE blogs for 2008. But how to decide? Google Analytics shows visits to site and provides no indication of how popular posts are to readers who subscribe using a feed reader e.g. Google Reader. Decided to use Tony Karrer’s idea of Top posts based on Delicious saves and used Post Rank to determine Delicious saves. Why 100 Conversations is a really good or bad idea? Any one interested in joining me in either of these? Top Problem I Failed To Solve! 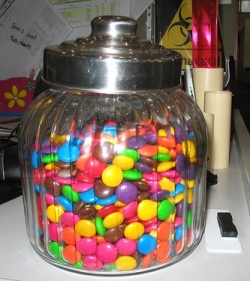 Lolly (candy) jar has won! 2 years of plotting how I could get the it removed from desk right next to me, including hiding it, and I’m admitting defeat. Nothing worked. I always said it was me or the lolly jar — one of us had to go! Surely the 2 weeks of toilet dramas? I tweeted 23 times about toilet and 16 times about plumbing problems over 2 weeks. How can we forget the first toilet tweet? 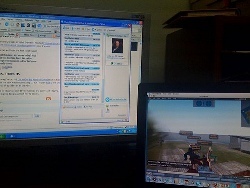 While writing this post on my PC while testing Second Life on my MacBook (to get ready for the Edublogs Awards ceremony) and having a Skype Chat (while watching Twitter on two computers). The way I’ve tackled Life is One Big Top Ten (2008) made it hard for me to cover Ten since it would have made the post way toooooo long….. But I’m sure Paul C will understand and besides Darren Draper taught me it’s okay to break all the rules. Who do I tag? No one 🙁 I’ve never had any success at tagging. But if you like any of my topics or the idea of the Big Top Ten please feel free to join us. My brain just exploded. You really are too much sometimes. So many MORE things to now investigate, love it. I reckon I might be just about ready to join in those two too, no not in a ballet dress, Tony’s 100convos and Steve’s 30 day blog challenge. But the question is which one do we do first Tony? Probably Tony’s 100 conversations because it’s happening now. Perhaps we could create a group and maybe even come up with our own extra conversations? I agree. There is so much here to explore, Sue. I will investigate some of your links to help me along in my blogging sojourn. Thanks for taking part in the Top Ten meme. I hope others can take part for some holiday fun and retrospective. Ah-em. If you will recall, Sue. I never said it was OK to break all of the rules. What I have said, however, is that rules exist to govern that 5% of the population that actually needs to be governed. The truth of the matter – at least as I see it – is that 95% of us will govern ourselves quite peacefully without an established set of rules. On one occasion, nevertheless, I do recall dismissing one particular set of rules. Do you think I failed in doing so? Thanks for the comment and suggestion. Im working to get a couple of teachers to work along with me, but maybe I should see if anyone in the twitter community would want to join in the challenge:) It really would help to have people to shoot around ideas. Lisa (tidertechie) – I came across another person yesterday who has started the 31 Day Project and left a message on her blog to check out yours. Seriously considering re-doing Project again myself — but pondering whether I might be crazy in that thought? I should encourage you to “just say no” LOL. But hey if you do we’ll have an expert with us…no pressure. Thanks for the tweet about the meeting last night!! I’m working through it already, but will slow down if more join. I really am fine doing it myself. Ill ask questions if needed, but everything is pretty self explanatory. I LOVE it and highly recommend to anyone. I cant believe all the things Im tweaking in a short amount of time. It has also given me some new thoughts for working with my students!! Yes I’m seriously considering doing it Lisa and yet I know how draining it was the first time. To be honest even considering it may mean I could be committed. Like the Comment Challenge, it’s very intense, and yet amazing how much you learn because of it.